More students of the University of Santo Tomas say "No To UST Hair Policy" to show opposition to the school's hair color and haircut policy. The Union of Journalists of the Philippines-UST Chapter (UJP-UST) has documented developments of the issue at hand on their Facebook page. The controversial measure was brought to the attention of Thomasians in late August, days before the Faculty of Arts and Letters (AB) implemented the haircut and hair color policy on September 1st. The Faculty of Arts and Letters (AB) will implement the haircut and hair color policy anew on Sept. 1, Tuesday. AB Assistant Dean Nancy Tabirara ordered the security guards of the St. Raymund de Peñafort building to confiscate identification cards of students violating the University Policy on Good Grooming. “Authorized by Ma’am Nancy Tabirara: Confiscate all those students I.D. 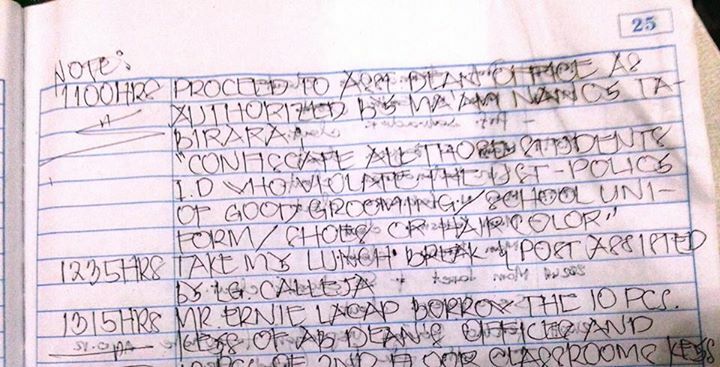 who violate the UST-Policy of Good Grooming/school uniform/shoes or hair color,” an entry from the guards’ logbook read, as shown by one of the security guards. UJP-UST tried to interview Assistant Dean Tabirara, but she will not be around until Tuesday. UJP-UST is yet to contact her to comment on the matter. The said Good Grooming Policy is under the University’s Code of Conduct and Discipline (PPS No. 1027), Number 4 in Policy Guidelines and Conditions. It is stated that, “Good grooming includes the wearing of the prescribed college uniform, the authorized shoes, the ID, the male haircut and other considerations that are similar to these”. The hair policy reads, “d) Unless otherwise allowed by the administrators of the particular Faculty/College/Institute/ School for specific reasons, male students are not allowed to sport long hair. Hair should not touch the collar of the uniform. The use of hairpins, pony tails, headbands, etc. by male students is likewise not allowed.” There is no mention of a prohibition on hair color in the handbook. AB students have been repeatedly asked to dye their hair black since Monday. “Upon entering AB, pinigilan na lang po ako ng guard and she simply took my I.D. without even an explanation,” Ada Lantion, a student of AB said. Lantion added that when she asked what the problem was, the guard told her that her pink hair is not allowed. “She told me to read the student handbook – in which I already did, and there wasn’t anything about hair color per se,” she explained. Several other students also complained that security guards warned them to re-dye their hair black, or else they will not be allowed to enter the building. The hair policy was shortly implemented last Academic Year, but was suspended after the AB Students’ Rights and Welfare Committee launched a campaign against it. The policy was suspended indefinitely until a formal dialogue between the students and the administration took place. The dialogue was repeatedly postponed, and the hair policy was not implemented since then. STAND in solidarity with your fellow Artlets in their fight against student repression by changing your Facebook profile photo to this picture and by liking and following NO to UST-AB's Haircut Policy. Collectively defend Artlets' constitutionally-guaranteed rights on organization, peaceable assembly, free speech, and EXPRESSION in UST! AB Students were caught off-guard with the sudden implementation of the haircut and hair color policy. Up to now, there has been no clear information on this policy. It has generated confusion and a feeling of repression among the students. On the surface, the hair policy seems to be a simple matter. But if we analyze more closely, we will see that the hair policy infringes on students’ democratic rights. The sudden strict implementation of the policy left no room for the students to air their concerns. It restricts our freedom of expression. Even the necessary information regarding this policy is being withheld from us. The haircut policy is a manifestation of the education system’s repressive nature. Such policies may lead to even bigger mechanisms that will violate our freedom and democratic rights. This has been the case in many universities throughout the country. We believe that the University of Santo Tomas should be an example of reversing, and not following this trend. Ultimately, if students cannot even decide on seemingly simple matters such as haircut and grooming, how will we be able to critique other problems that hound us? If we are to become critical leaders and catalysts of change, practicing that principle must start now inside our own university. The haircut policy affects all Thomasians. Thus, we call on all students to take part in this issue. Let us assert our right to be heard, and let us ensure that our democratic rights be upheld! 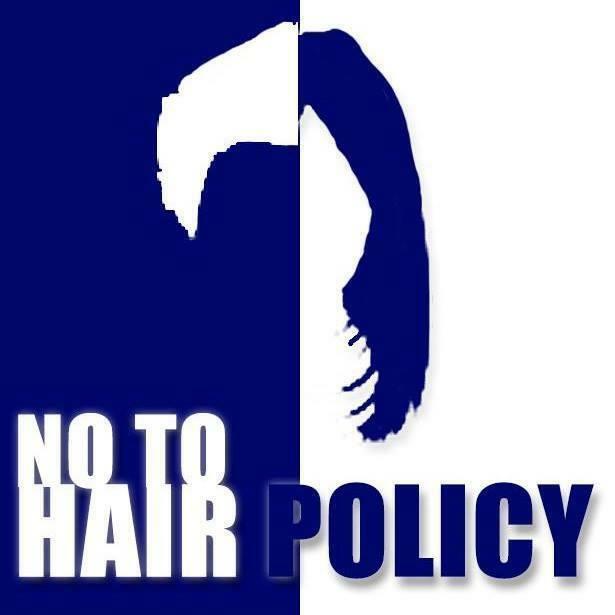 NO TO HAIR POLICY IN AB! STOP STUDENT REPRESSION IN UST! It was found out that UST had implemented the same policy in 2014, but the uproar wasn't as trending as now. Here's a manifesto of the students from last year. a) The uniform must follow the Faculty's/College's/Institution's/School’s design or pattern. The uniform by each unit of the University is in accordance with the standard of modesty commonly upheld in a Catholic institution. It must be worn with neatness or cleanliness. Deviation from the original design is not allowed. b) Students are enjoined to use the kind or style of shoes prescribed by the individual Faculty/ College/Institute/School. c) Students must wear the validated university identification card at all times within the university premises. Loss of the identification card must be reported immediately to the Office for Student Affairs (OSA). d) Unless otherwise allowed by the administrators of the particular Faculty/College/Institute/ School for specific reasons, male students are not allowed to sport long hair. Hair should not touch the collar of the uniform. The use of hairpins, pony tails, headbands, etc. by male students is likewise not allowed. e) Again, unless otherwise permitted by the administrators of the particular Faculty/College/ Institute/School, male students are not allowed to wear earrings, sport any form of body piercing and other accessories ordinarily used by females. f) Students are not allowed to sport tattoos. g) On occasions where students are allowed to wear civilian attire, it is expected that they conform to the standards of propriety and decency. Micro- mini skirts (more than 3 inches from the kneecap), short-shorts, cycling pants, tube, sleeveless, plunging neckline blouses, see through blouses, halter tops, backless tops, backless tops, tank tops, leggings, sandos, sleeveless jerseys, and slippers are considered inappropriate campus attire. Any Faculty/College/Institute/School which seeks to take exception with respect to the provisions on Good Grooming, must duly and officially petition the Father Rector for such exemption, with specific reasons/explanations. The letter of request for exemption must be discussed and approved by the Academic Senate. Upon approval of the exemption, the concerned Faculty/College/Institute/School must duly inform the Assistant to the Rector for Student Affairs and the SWDB Director. "Also, the Conservatory of Music doesn't implement the Hair Policy. According to students, the case of AB and CFAD is seen questionable since both are colleges of arts (liberal arts for AB)." 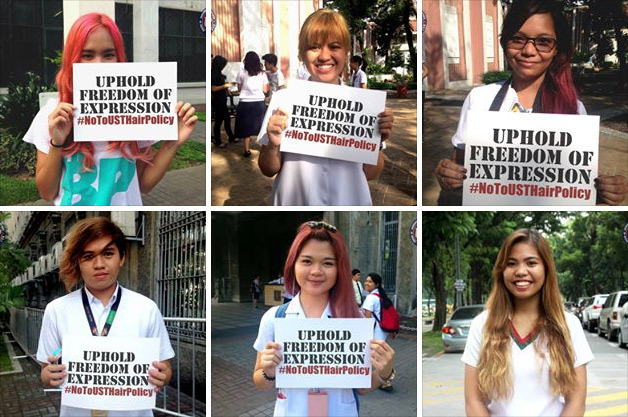 Photos of students who support the "No To UST Hair Policy" Movement can be viewed on this album while posts regarding developments about the issue can be found on the UJP-UST timeline.